When it rains, it pours. So it would seem here in South Florida these past couple of days. Last week when I left for Las Vegas, we had been dry for a while and our poor little plants would go limp as they begged for water by early afternoon. Without anyone to take care of the plants, I watered heavily before I left for my trip and hoped for the best. Of course when we got home everything was on its way out. I had to clip back the dead foliage and unfortunately, discard a bunch of plants that didn’t make it. I’m going to miss my beautiful basil. I knew in my heart of hearts that this was going to happen but hoped that we would get those afternoon showers that South Florida is so famous for. No such luck. That is, until now. It’s as if the sky has opened and the heavens are pouring down upon us. The water just won’t stop. It’s not only rain; we’re also getting (on and off) winds of epic proportions. Last evening the roof was torn off of a local civic building and was nowhere to be found! They sent helicopters out this afternoon to try and locate the roof! I have never heard of anything so strange… not even during hurricanes. The weather center believes that we were hit with (at least) a couple of tornados last night. As I write these words, my pool is overflowing, palm branches are strewn all over the property and I think that the foliage that was only days ago, literally “dying of thirst” are now screaming “uncle!” as they reach their saturation point. As if that isn’t bad enough, we keep losing power and lose our cable even more often. Cable shuts down about every 5-7 minutes. By the time it reboots… it shuts down again. I remember one time a few years ago, I had flown up to New York to help my sister Theresa decorate her daughter’s bedroom. I was going to paint murals and assist in designing the room (I have a gift for that stuff). 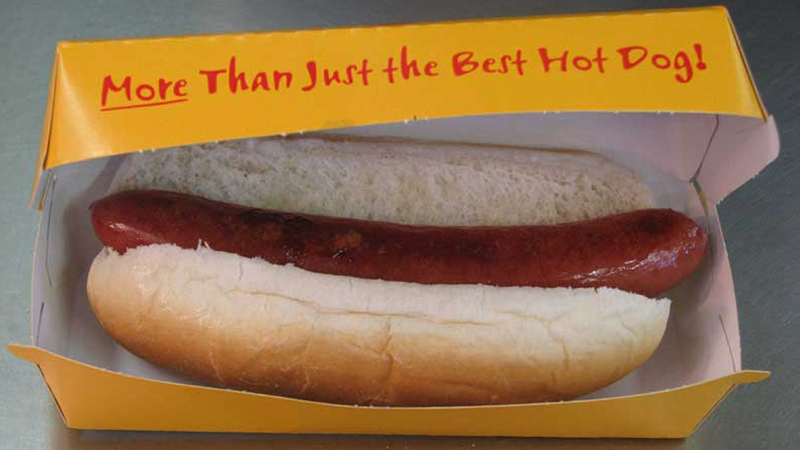 As I exited the plane at the LaGuardia airport terminal, I was chatting with James via my cell phone, when I spotted a Nathan’s Famous Hotdog Stand. I had not had a Nathan’s hotdog in years and told James that I hoped my flight back would allow me time to indulge in this delectable blast from my past. On my return flight, New York was hit with a massive snow storm that brought the airport to a screeching halt. I was trapped in the terminal for 36 hours and the only place opened to get any food was… you guessed it, Nathan’s Famous Hotdogs! Funny how something that would have normally been considered a treat, became so unwelcome and unpleasant when it was the only nutrition available for a day and a half. Being an airport kiosk, they didn’t even offer fries or ANY other kind of food… just franks and soda pop. I never craved oatmeal so badly in my life. I would have given my kingdom for a peanut butter and jelly sandwich or even a doughnut. I learned then, that next time I would wish for just enough time to have “A” frank before catching my flight. Live and learn! So it is the same with all those who wished that it would just rain already. If you’re going to wish for something, be specific! As for me, I will spend the evening writing and/or cooking. Rainy days (and nights) like these were just made for my mother’s wonderful beef and rice dish that is as comforting as it is delicious! It’s also extremely easy to make. You simply put the meat up to braise and in a couple of hours, you are enjoying a hearty, healthy and oh so satisfying family dinner. Did I mention that it is also very inexpensive? Hmmm… Maybe tomorrow’s Blog should be my mom’s recipe. What do you think? Okay Lisa… I promise to post the recipe this weekend! Don I made it last week and loved every bite!! MMMM so darn good!